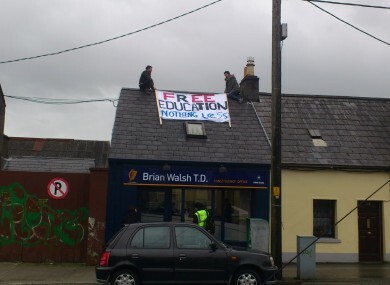 Students climbed onto the roof and entered the constituency office of Brian Walsh TD in Galway earlier today. The students have climbed on to the roof of the constituency office. NINE STUDENTS HAVE been arrested after they occupied the constituency office of a Fine Gael TD in Galway city this afternoon, protesting against the reintroduction of third-level fees. Two students climbed on to the roof of Brian Walsh’s office and unfurled a banner while a number of students entered the office and chained themselves to desks. The protest was disbanded around lunchtime after gardaí arrived on the scene and made the arrests. The NUI Galway students were protesting on behalf of the Free Education for Everyone (FEE) campaign which advocates free education at all levels for all citizens. Gardaí were called to the scene and arrested one of the students before the protest was disbanded and another eight students were arrested. All nine of the students were taken to Mill Street Garda station, gardaí confirmed. A FEE branch organiser in Galway, William O’Brien told TheJournal.ie that the organisation was targeting Fine Gael TDs as the Union of Students in Ireland’s (USI) focus on Labour TDs over their pre-election promises was not “not going far enough”. We are engaging in non-violent direct action in a bid to make our voices heard. Marches are not enough, the different movements resisting austerity need to unite and engage in tactics that are not ignored. A staff member in the constituency office declined to comment when contacted this afternoon. Walsh told TheJournal.ie this afternoon that he had been notified of the protest just after midday and said he had no prior notification it was going to happen. Speaking from the Dáil, he claimed the students were being abusive to staff members and constituents and said that there was “a lot of chaos”. O’Brien said he “absolutely refuted” that claim and said the protest was ”constructive but our methodology a bit more extreme than has been used before”. Walsh, a former Galway-Mayo IT student union president, said he was willing to meet with the protesters to discuss their concerns but said it was “disappointing” they were taking such action as it was premature. “The protest is premature because no decision has been made in relation to student funding yet and at the moment it’s purely speculation,” he said. O’Brien, who is also an equality officer at NUIG students union, called on all students unions to stand in support of FEE’s campaign. He declined to comment on whether there will be any further occupations of TDs’ offices. Email “Students arrested after occupying Fine Gael TD's constituency office ”. Feedback on “Students arrested after occupying Fine Gael TD's constituency office ”.